Heavy on the flavor, light on the other stuff. This variety offers the scrumptiousness of SPAM® Classic with 33% less calories, 50% less fat and 25% less sodium, which means you can enjoy the taste you love more often. 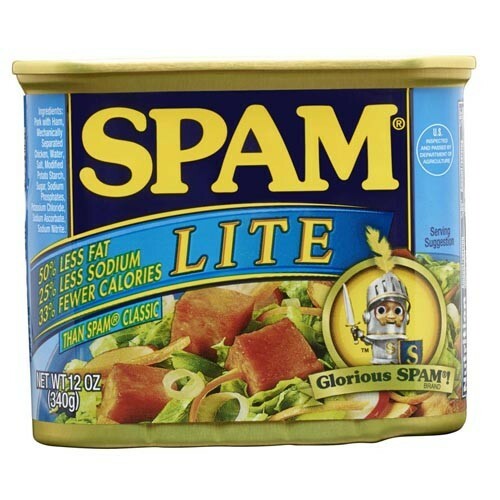 Its the perfect SPAM® variety for swimsuit season. 12 OZ CAN *ADDITIONAL SHIPPING CHARGES WILL BE ADDED ON ANY FLAVOR. **CANNOT SHIP THIS PRODUCT OUTSIDE OF THE UNITED STATES.